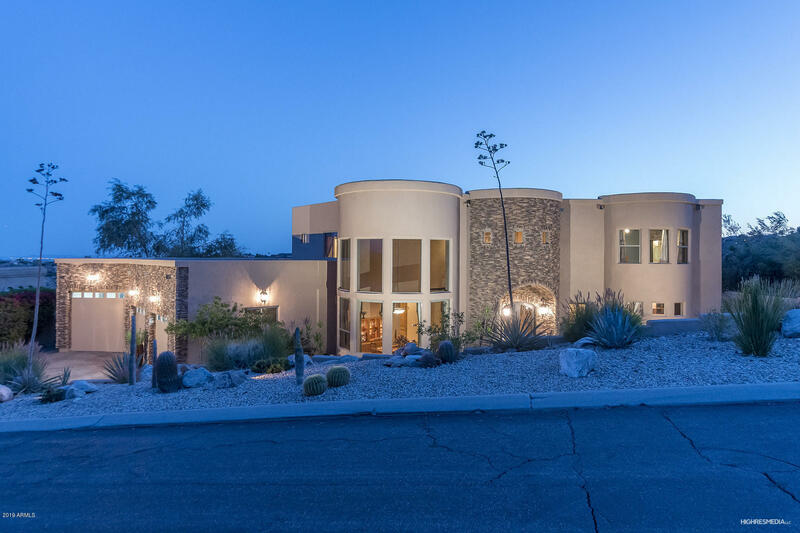 This beautifully built custom residence in Fountain Hills sits perched among the hills of Stoneridge Estate with wide open mountain views. This two-level design was built with curved architectural lines and high-quality finishes. Large picture windows and views from every vantage point bring the outdoors in. The main level master suite is spacious with a dual-sided fireplace and spa-style bath. The guest bedrooms are en-suite with private baths and walk-in closets. Additional space includes a dedicated wine cellar, upstairs loft and private theater room. Outdoors you'll find a pool and spa, spacious covered patio with misting system, fire pit with banco seating and upstairs balcony.